Based on the latest urethane technology, #1285-CL is an environmentally conscience, water-borne coating with catalyst made of a blend between 80% urethane and 20% acrylic. Low odor, non-yellowing and non-flammable – meets the current VOC regulations. 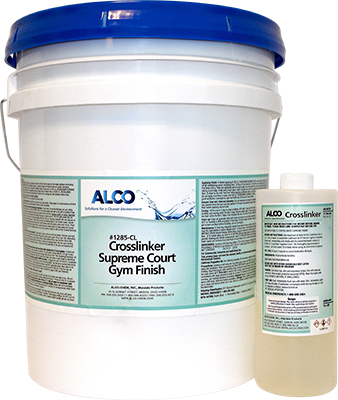 This two component gym finish ensures durability and is ideal for coating gymnasium floors, racquetball courts and other wood floors. Easy application, self-leveling, and can be applied over solvent-based coatings without having to remove them. Dry time is 1-3 hours (depending on conditions) and covers approximately 800 square feet per gallon! Gym floors can be coated and ready for activities within 48 hours! For best results use with Prep Four Solventless Wood Floor Cleaner!